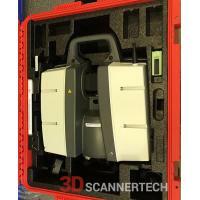 Used 2016 Leica 3D ScanStation P40 for sale. Lightly used, like new, ready to scan condition. new Leica Customer Care Package (CCP) and factory calibration certificate provided, 1 year manufacturer warranty. 1x ScanStation P40 Target Package with: 4x GZT21 Scannng Target, 4x GAD50 Stub to Screw Adapter, 4x Flat Magnet Mount, 1x GVP703 Soft Bag.